Creta Louis Magni Medio Iacet Insula Ponto. A scarce 1606 old color Abraham Orteilus map of the Mediterranean island of Crete, Corsica, Sardinia, and the Ionian Islands in antiquity. Essentially four maps on one sheet. 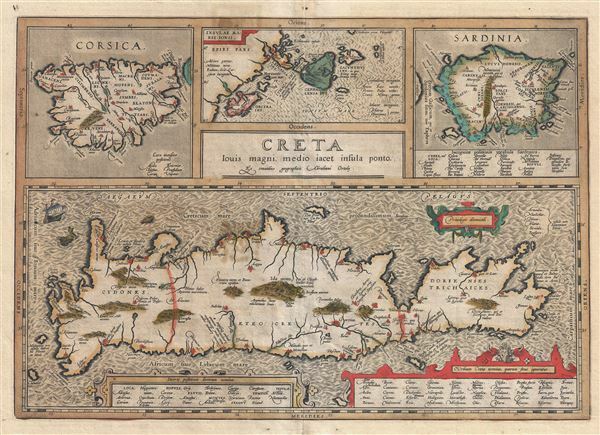 The upper left map details Corsica, the top center map the Ionian Islands, the Upper right map Sardinia, and the primary map, for with the entire sheet is named, presents Crete. This map was prepared and issued for the 1606 English edition of the Orbis Theatrum Terrarum, of which 300 were issued. Corresponds to third or 1601 plate. Very good condition. Wide margins. Original plate mark. Minor marign repair to verso. English text on verso. Ort 217 (Koeman/Meurer: 7Pa-d, Karrow: 1/158-1/161, van der Krogt AN: 7900H:31).